Don Murray during his time in Brethren Service. As is fitting for a people who gather around Scripture, Brethren also gather around stories of heroes in the faith. Unfortunately, given the lack of documentary evidence, early Brethren history is often shrouded in mystery. Documentation is sparse and the room for conjecture large. This is where the Brethren Historical Library and Archives (BHLA) enters the equation. Tasked with the assignment of collecting and preserving the historical record of the Brethren experience, the BHLA is the repository for far more than the official agencies of the Church of the Brethren. It is committed to preserving the documentary evidence for a movement that has left a deep impact wherever its members have been. This includes local communities in North America, the establishment of hospitals and schools in India, Shanxi Province China, and Nigeria. Brethren also pioneered in evangelical and social justice outreach in locations like Denmark, Austria, and even in war-torn countries of Spain and Vietnam. As a historian, I know there are certain commonly believed Brethren stories, and even strongly held beliefs, where supporting evidence is either thin or non-existent. Despite the beard, Abraham Lincoln was not secretly baptized into the Dunker fold. Nor did the early Brethren invent Sunday school. Or on a more controversial note, it is puzzling that folks who believed in no force of religion also disciplined erring brothers and sisters by disowning them. The story of Brethren influence in the creation of the Peace Corps has always intrigued me. Did Brethren Service really provide the model for the Peace Corps? In an age of false news and alternative truth, I sought to find the answer to this question. In November, I interviewed Don Murray—a conscientious objector to war, distinguished actor, and former Brethren Service worker. He served in Brethren Service from 1953-1956 working in Germany, among refugees in Naples, and later in Sardinia with both Brethren Service and the Congregational Church. 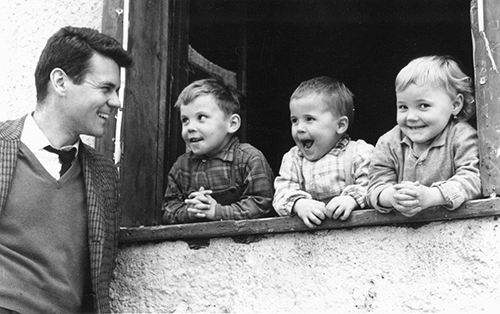 In Sardinia, he organized the Homeless European Land Program (HELP) which on 130 acres built homes and established several businesses providing both a community and employment for refugee families. For Don Murray, Brethren Service was a transforming experience. As he tells the story, the Peace Corps was the product of an importune speech he made in Hibbing, Minnesota, in 1956. A recent co-star with Marilyn Monroe in Bus Stop, Murray was asked to introduce the Democratic vice-presidential candidate at a campaign rally. When the vice-presidential candidate’s plane was late, Murray was asked to entertain the audience with stories from Hollywood. Since the New York-based Murray, who had spent most of the last three years in Europe, had little Hollywood gossip, he regaled the audience with stories of his Brethren Service experience. Among those in the audience was Minnesota Senator and later Vice-President Hubert Humphrey. A serious Christian and Methodist, Humphrey was moved by the story and arranged an interview for Murray with President Dwight Eisenhower. Although not enacted during the Eisenhower administration, Humphrey’s, or as Humphrey called it, “Murray’s plan,” was subsequently introduced in Congress. It was this legislation that laid the ground work for the Peace Corps. 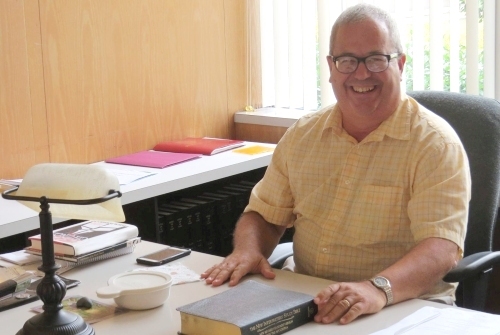 Today Don Murray, who became a member of the Church of the Brethren and considers his time in Brethren Service as one of the most meaningful experiences in his life, remains deeply committed to the values he learned from his Church of the Brethren. He was blessed with many Brethren friends and mentors including Dan West, Harold Row, Dale Aukerman, Ken Kreider, and Don Miller. The interview with Don Murray is one of many treasures housed in the Brethren Historical Library and Archives. While there may not be evidence for some of our Brethren myths, it is inspiring to know that there is for this one. Don Murray’s story is a reminder of the power of the faith and actions of all who are willing to serve the world in the spirit of our Savior. Learn more about the Brethren Historical Library and Archives at www.brethren.org/bhla or support it today at www.brethren.org/give. Mark Flory Steury at the Church of the Brethren General Offices. This is a comment I hear often as I talk with congregational leaders and pastors about the denominational work of the Church of the Brethren. It has been my joy to visit many congregations over the past five years, and to thank them for being so generous! For well over one hundred years, congregations have faithfully supported the work of the church through their offerings. When I visit a congregation, we talk about the ways the Church of the Brethren is currently serving in ministry both domestically and abroad. Globally we have partners in Nigeria, India, the Dominican Republic, Brazil, Haiti, Spain, South Sudan and many other places. We help people in times of need through Brethren Disaster Ministries, Children’s Disaster Services, and the Global Food Initiative. Volunteers serve as the hands and feet of Jesus through Brethren Volunteer Service and Workcamps. These are some of the ways that we extend the love of God to others. We also provide resources for churches and individuals across the country. We support the work of new churches through the Church Planting Conference. We equip church leaders and members through the work of Congregational Life Ministries, the Ministry Office, and Brethren Academy for Ministerial Leaderships, and through materials like Vital Ministry Journey, the Anabaptist Worship Exchange, the Shine curriculum, and webinars. Faith-forming, community-fostering conferences and programs are provided throughout the year like National Junior High Conference, Christian Citizenship Seminar, Ministry Summer Service, National Young Adult Conference, and National Older Adult Conference. Conversation and information are shared through Newsline and Messenger magazine. We also have wonderful historical resources preserved through the Brethren Historical Library and Archives. This is just a brief overview of the many ministries we do together! Amazing! How is the Church of the Brethren able to do all of this? It’s only with the support of congregations and individuals who are willing to work together for a common mission and ministry. It is remarkable how much the Church of the Brethren is able to do. Thank you so much for your awesome support. We can do this work only because of your partnership. May God bless us as we continue in our work together.